When I interviewed Terry Hope Romero about her cookbook Viva Vegan! 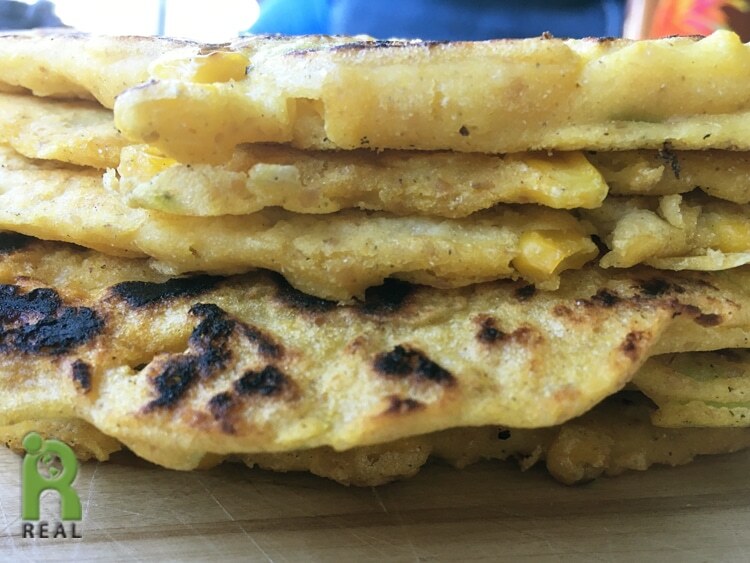 I went nuts over her very simple Arepa recipe, a corn tortilla or pancake made with masa harina. But since I live with an Italian, polenta is more of a staple in our house than masa harina. I came up with this recipe using polenta. Serve with REAL Black Bean Paté. Optional: You can flavor this cake any way you like. Try adding 2 tablespoons of chopped olives, scallions or pesto. If using polenta or coarse corn meal, then process it for a couple of minutes in a food processor or coffee bean/spice grinder to make a finer ground. Add the flax and salt and pulse to incorporate. Pour in the water and process, making a batter. Add the corn and pulse a few times to mix and cut up the kernels a little. Let stand for about 15 minutes. Preheat oven to 200oF. Heat a cast iron griddle or skillet on medium high. Lightly grease with oil. Pour 1/4 cup of batter on the griddle for each cake. Add as many as will fit on the grill, about 1 inch apart. Cook for several minutes until the edges are dry. With a spatula flip the cake and flatten it down. Cook another couple of minutes until lightly browned. Remove and place on a baking sheet in the oven to stay warm while you finish the remaining batter. Makes a dozen corn cakes.